'Riders on the storm' was written and recorded by The Doors on their 1971 album 'L.A. Woman'. According to band member Robby Krieger, it was inspired by the song '(Ghost) Riders in the Sky: A Cowboy Legend', a country and western song from 1948. The original recording incorporates real sound effects of thunder and rain, along with Ray Manzarek's Fender Rhodes electric piano playing, which emulates the sound of rain. 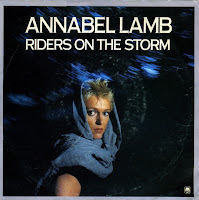 Annabel recorded a cover version in 1983, which leaves out much of the original version to replace it with modern synth sound effects. Unlike the original, the single didn't chart outside the UK. Annabel Lamb was born in Surrey, England in 1958. She released her debut album 'Once bitten' in 1983, and this single, a cover of the well-known track from The Doors. It earned her her only hit, because she got to no. 27 in the UK singles chart with this. She subsequently released six more albums, with little chart success. This 12" single includes a longer version of the single track, with some extra guitar solos here and there, and a dub version, which is basically a remixed instrumental track. This version of the Doors classic is one of the more interesting ones, in my opinion. 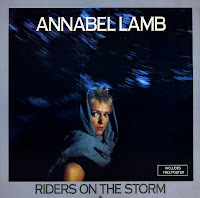 My copy of the 12" version includes a small poster of Annabel, who was not your average pinup, by the way.